Which Signicade Sign is Right for Me? If you are looking for quality sign products that will last and withstand tough weather conditions, Signicade signs are one of the most reliable brands available. Signicade signs are portable and durable. They come in several versions to accommodate the needs of any business. 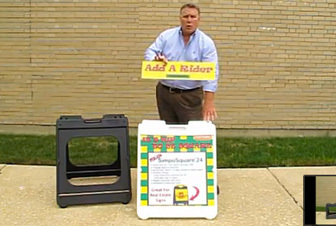 The original Signicade Sign Stand is made of heavy duty plastic and has a slightly recessed face to help protect the sign that you may install with screws, nuts or two-sided adhesive. They can be internally ballasted with sand to keep them standing in windier conditions. This sign type is best for displays that are permanent or that you plan to change infrequently. If you are in need of a sign that will allow you to change messaging more frequently and easily you will likely find the Signicade Deluxe Sign Stand to be the best fit. These sign stands also are made of durable plastic and allow for internal ballasting with sand to stabilize for windier weather. 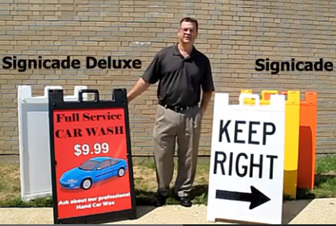 Additionally, the Signicade Deluxe Sign Stand has a “Quick Change” feature which allows you to quickly and easily change your messaging. Once your new sign message is inserted “Stay Tabs” keep your sign securely in place. For a more complete look at both signs, please watch the video below. Call us at 866-966-1018 with any questions you have.